Hello Friends! It's April from Grade School Giggles! Last week we kicked off our weekly linky party all about organizational tips and tools. This week we're doing it again and we would love for you to join us. 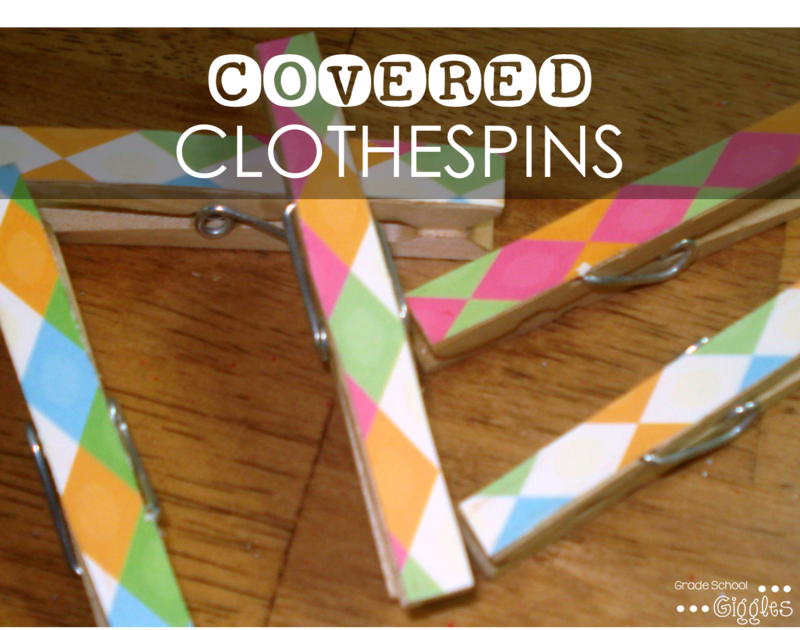 I am starting the party off by sharing my favorite way to cover clothespins. I love to use scrapbook paper. It's easy and the design choices are endless. The first thing you'll want to do is pick out a piece of scrapbook paper. Next, hot glue some clothespins to the back of your scrapbook paper. Finally, use a sharp pair of scissors to trim scrapbook paper off cutting as close as possible to the edge of the clothespin. That's it! I usually just hot glue my clothespins to the wall. Gluing thumbtacks to the backside of the clothespins makes them perfect for bulletin boards. You can also attach them to walls using a Command Strip cut in half. Stick one side to the back of the clothespin and attach the other to the wall. It's easy-peasy & damage free! I'm giving my clothes pins a makeover. For this school year I had clothes pins covered with some glitter tape I found at Joann's Craft Store (I used an Exacto knife to trim the tape), but the tape was coming off in the corners. For this reason I bought some metallic silver craft paint, and I'm painting them. Then I'm going to spray paint them with glitter spray paint because I absolutely LOVED the glitter look last year. One really helpful thing I learned last year is to glue the thumb tack on in the middle of the clothes pin (so it is close to the spring). I had originally glued the thumb tack to the top as I saw on Pinterest but slowly they all came off, so I would definitely recommend gluing just above the spring.